Seasonal fruit salads are perfect for light meals or desserts in the summertime, and adding lime and mint just brightens the flavors. When the temperatures start to soar, the boys and I like to pair fruit salad with fresh cheese and whole grain crackers for a healthy lunch. I don’t measure the fruit, I just put a few spoonfuls in each bowl, and I kinda sorta make a wild scientific guess as I stir together the lime syrup, so don’t hold me to any of these measurements. Just relax, kick back, and enjoy the last days of summer as you savor the salad. This version uses fresh cantaloupe and strawberries, although you can choose from a host of fruits, including blueberries, watermelon, mango, kiwi, raspberries, and blackberries. The lime syrup is made from simple syrup that I always have in my refrigerator, and the mint comes fresh from my container herb garden. 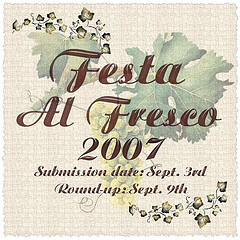 This is my (late) contribution to La Festa Al Fresco, an annual event hosted by Lis of La Mia Cucina and Ivonne of Cream Puffs in Venice. These gals throw quite a party, so be sure to head on over to the round-up on September 9. 1. SYRUP: Bring the water to boil then stir in the sugar. Cook until the sugar dissolves completely, then remove from heat and allow to cool to room temperature. Store in the refrigerator in a plastic squeeze bottle for easy dispensing. 2. Pour 1/4 cup of the simple syrup into a small bowl. Add the lime zest and juice, and stir. Set aside for about 30 minutes. 3. To serve, put the fruit into salad bowls, pour the lime-infused syrup over the fruit and garnish with the minced mint leaves. Enjoy immediately. This sounds like the perfect way to have summer fruits! If you are bringing something like this.. you can be as late as you’d like!! And listen to me.. I haven’t posted mine yet (or made it! eek!) I am a horrible hostess! Anyhoo your salad looks divine.. I make salads like this often they are so refreshing and the syrup really helps those fruits that have no taste or are on the too tart side. Wonderful!! Better late than never, Andrea! Thanks for bringing this incredible fruit salad to the party! I’ll bet the mint makes it really special. Thanks for posting. I love these kinds of salads. I will have to try the simple syrup. Usually I just squeeze lime on the cantaloupe and then sprinkle on mint chiffonade. Deliciosa!!! Lovely picture. I alove cantaloupe. I can eat it all day. Iike what you did with it in your salad. Try to add next time some lemon thyme, it gives a nice citrusy, woody taste to the fruit. what a beautiful salad! i had something similar for breakfast in a top austrian restaurant in the summer, only with water melon, and much less mint… alas. this looks like it’s going to end up on my breakfast table on sunday – marvellous! Deborah, Ahn, Terry, BlueZebra, thank you! Lisa, you crack me up! Thanks to both you and Ivonne for creating such a fun event! Rose, good tip on the lemon thyme, I bet that does give it a nice flavor. Johanna, I’m so envious of your summer travels! Maybe I’ll get to do some traveling again sometime soon. What gorgeous color! Evidence that delicious simplicity is best! I agree, it looks so refreshing! We have fruit salad all the time at our home, but I never added the syrup nor the mint leaves… thanks! Just tried it this morning, it is sooo good! I added some oat bran on top. Thanks Andrea! T.W. & Peabody, thank you very much! Cris, I’m so glad you liked it. Nice touch with sprinkling some oat bran on top. That looks so refreshing. I’ll be keeping this one for when it warms up a bit here…. and when my mint grows back after the winter frost. New to the internet but found your site interesting. 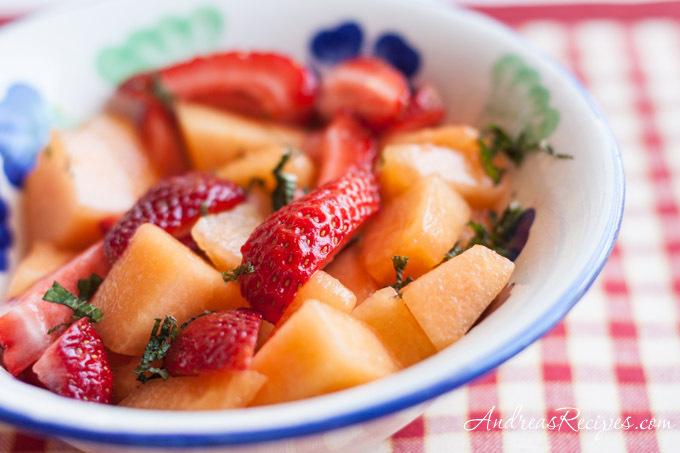 I’m looking for a cantelope salad recipe that has olive oil w/lime or lem juice over the fruit sprinkled with pepper flakes and topped w/chopped mint. I would love more recipes using mint & melons. Do you have any more? I agree with everybody these look so refreshing. In my house we have fruit salads all the time it’s a great way for me to get fruit into the kids, I’ve never tried adding syrup or the mint leaves so I think I’ll have to give this a shot.